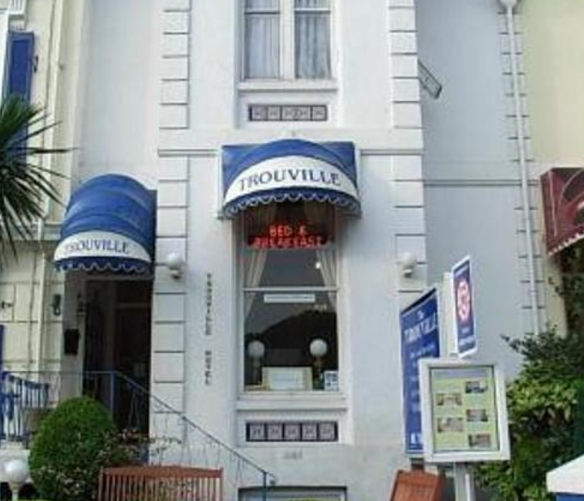 Your hosts Tony and Tasanee, welcome you to The Trouville. We are a family run, centrally located, bed and breakfast accommodation perfect for the beach, town centre in fact anywhere in South Devon. With a vast range of restaurants, bars and nightlife only a short walk away you can leave the car on the car park and enjoy a casual stroll to the marina/harbour area. It's just a short walk to The International Riviera Centre, Torre Abbey, Torquay Tennis Club, Torquay Bowling Club and most importantly one of the best sea views England can offer. Our welcome extends to all. whether you are looking for that mini/weekend break, family holiday or celebrating a special occasion with friends. Our accommodation is the ideal place to relax and plan how to spend your days away. Group bookings are also welcome. Stag and hen parties only available by special arrangement. Sorry, but we cannot accommodate Children under the age of 5. We hope you enjoy visiting us. Tony and Tasanee. A short break with my kids.